I’ve been riding time trials for several years, but it doesn’t necessarily mean I’m particularly good at pacing. Sometimes, I get it wrong, sometimes, by good luck I get it right. I’m trying to improve on this aspect quite a bit at the moment, and it’s quite fun to work out best way of measuring you’re effort. A power meter may take a little romanticism out of the sport, but it is very useful for evaluating how you paced a race. The one consistent thing I’ve noticed with looking at a power meter is that in races, I nearly always go off way too hard, and end up dying by the end. (and I would hazard a guess 90% of beginners do this too) Maybe it’s the hill climb masochistic thing coming to the fore. ‘start off really hard, hang on.’ – and maybe that does work for a climb like the Rake, but it’s not really the best for a 10 mile time trial, even if it does make an impressive soundbite. Today, was a 10 mile TT with exceptional weather. Very windy – 20mph, with gusts of up to 30mph. Not quite as windy as Nat Hill climb 2013, but pretty close. Any windier and it would start to get pretty marginal over whether it was worth riding. It was definitely a day to leave the Zipp 808 at home (10 races so far this year, still not been able to use the Zipp 808). But, I still used a disc and Zipp 404. The course was the H10/17R on the A420. Not the fastest course, but local. The weather meant it was 5.5 miles to the turn (with strong tailwind) and 4.5 miles into roaring headwind. My pacing strategy was to try keep at 300 watts on the way out, and then blast it at around 350 watts on the way back. It would feel like a sweat spot training session on the way out – and then treat it like a long hill climb on the way back. In the end, I was pretty close to my rough plan. I looked at my power meter a few times on the way out, and as a result backed off a little. On the way back, I never looked at power meter – I was concentrating on staying upright, and I have a pretty good idea how to ride a hard 10 minutes on feel. Av. power – 305 watts. Average power of 325 watts. It was hard to keep at 300 watts on the way out, the temptation is to go much faster. It feels like you are not making much effort. I put a 56 chain-ring on, and was spinning 100 rpm in the 56*11 for a bit. It would have been faster on the outleg, but, I had to come to a complete stop at first roundabout on the way out. It’s a bit of a pain having to break from 35mph to 0 – but there you go. On the outleg, the average speed was 25mph. But for the first 1–2 miles of return leg, it was quite sheltered and relatively quite fast. But, then you hit an exposed part of the course, and it was time to grovel into the wind. At the last roundabout with 1.6 miles to go, I was on target for a course pb. But, that last mile or so was really hard! Why do you need to make more effort into the wind? In many cycling books, you will see the advice that if riding into a headwind, take it easy, go into a lower gear. But, if you’re racing this is the wrong advice. When it’s headwind go harder. The bigger the headwind, the more effort you need to make. For example, with strong tailwind, you can do perhaps 33mph, with 300 watts. If you did 350 watts on the way out, it wouldn’t be much quicker anyway. But, being able to make more effort into the headwind, decreases your overall time. Aero drag increases exponentially at higher speed. Therefore 10% more power at a low speed gives a bigger return than 10% more power at high speed. On a practical note, I couldn’t really go faster on the way out – even with 56*11 you’re getting close to spinning out. 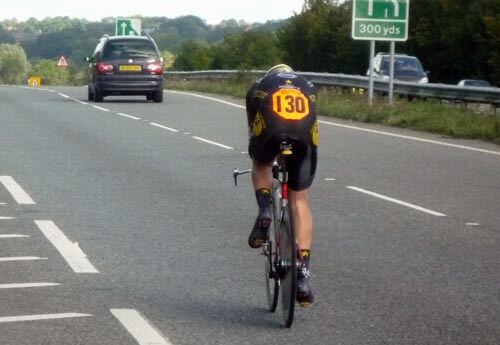 Nick English (AwCycles.co.uk) won in a time of 20.20. As a cyclist and physics student, the science behind pacing strategies is really interesting. It’s all due to the fact that the force is drag is proportional to the relative velocity (between you and the air) squared. This means – like you said – putting out 340 watts instead of 300 will not make you go much faster than 33mph. There has been some good papers published on the subject and this one (http://www.sciencedirect.com/science/article/pii/S1877705813011132) being particularly interesting. It’s all about minimizing the time while using a pre-set amout of energy/work. thanks for link Tom, though you may need to be a physics student to fully appreciate paper. Surely you are confusing speed over the ground (needs to be high to win TTs) and speed relative to air mass. Say the wind is a steady 30mph (unlikely, I know but go with me). Standing still you’d be feeling the drag of the air passing you and tend to be blown over. With a tailwind, if you cycle at 30mph you’ll be travelling with the air – no drag! Here any extra effort will gain maximum advantage. With a headwind you need to add 30mph to your ground speed and any extra effort will be at the exponentially higher drag and therefore a waste of time! I know there are billions of other real world factors at play when you are sitting on a bike but perhaps investment in an anemometer as well as a power meter would be a good idea! It’s correct to push harder up hill than down hill due to the fact that you waste less energy to drag while going uphill. It’s also correct to push harder on the flat into a headwind than with a tail wind, but the reason is different. At 25mph with a 5mph head wind the drag will be the same as 35mph with a 5mph tail wind, but the mechanical losses from the drivetrain and tyres will be much higher at 35mph compared to 25mph.